The Wait Until action enables you to wait for a specific amount of time before continuing the project run. If you want to wait for a specific length of time (instead of until a specific time), use the Delay action. Specify the time you wish to wait for by typing it into the field, or click the drop down button to see an analog clock face that you can (optionally) use to set the time. Use the left and right mouse buttons to set the hour and minute hands, respectively, then click the "Set" button to set the new time. The action will go off at the next occurrence of the given time (ie today or tomorrow.) If you set the time to be 5pm and the action starts at 3pm, then it will wait for two hours. If the action starts at 6pm, it will wait 23 hours until 5pm the next day. The action will run the same day that it is started. If you set the time to be 5pm and the action starts at 3pm, it will wait for two hours. If the action starts at 6pm, it will run immediately. The action will run at the specified time, the day after the action is run. The action will wait for the specified day of the week. The action will wait for a specific date before running. If the date/time combination has already passed when the action is run, it will normally continue immediately. 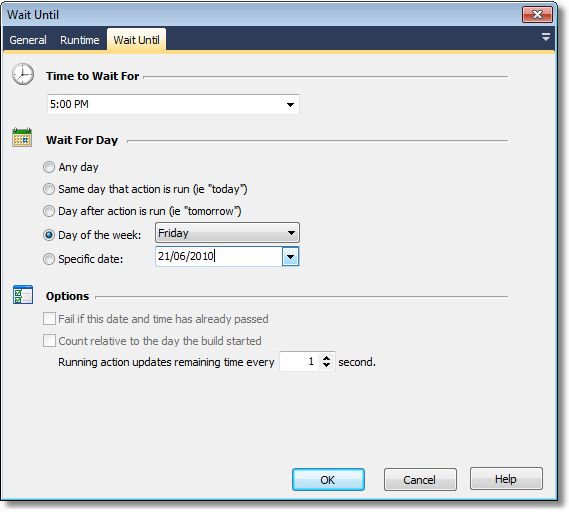 Check this option to have the action fail outright if the date and time have already passed. While the action is running, the Current Running Actions section of the Run Tab is updated with a progress bar and the amount of time left until execute resumes. Use this option to determine how often that information is updated. To disable updates entirely, set the update interval to zero seconds.